SITUATION: 74-71 for Arellano with time down to 40 seconds in the game. WHAT TRANSPIRES: Jio Jalalon surveys the defense and his options. 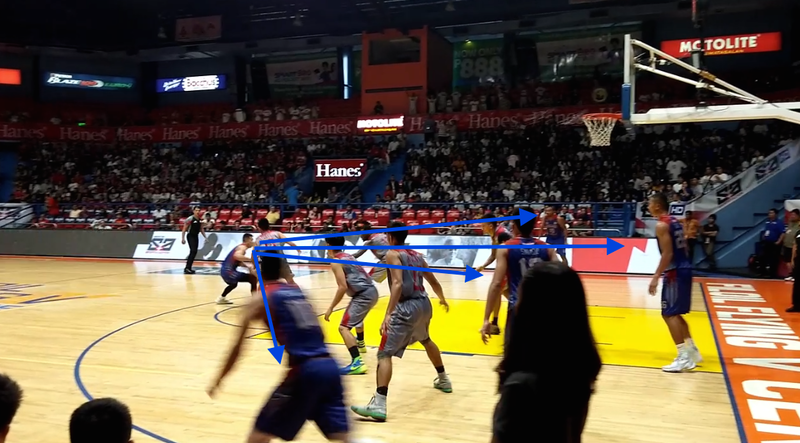 Take a gander at the position of Jalalon's teammates. That is pre-designed to pack in the defense and to allow Jalalon to take his man on one-on-one. Lyceum's defense if you notice clogs the lane. If they want to cover the options they have to react quickly and to cover the open man. 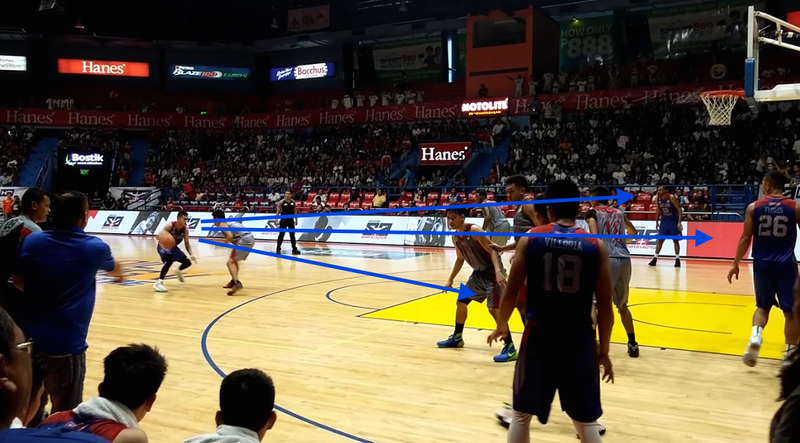 I think that LPU made a mistake by asking Jesper Ayaay to cover Jalalon who is quicker. They should have thrown Jeb Bulawan at him. Bulawan has longer arms and strides. In the open court, Jalalon is quicker. Half-court, crap shoot. Plays like this takes timing. Moving into pre-desgined positions and sets for open shots. For the defense. Jalalon makes his move. Mike Nzeusseu softly helps out so he can recover to Dioncee Holts who is now wide open from the left flank. Bulawan moves forward and now Lervin Flores has a little more room to operate for an undergoal stab. Kraniel Villoria (#18) moves into position above the three-point arc. Here is why Jalalon is one of the craftiest if not the craftiest point guard in college now. He draws the defense and all his options are still open. Mistake for LPU! They commit four players to him leaving only Bulawan home to cover two players -- Kent Michael Salado and Lervin Flores who both lurk underneath. 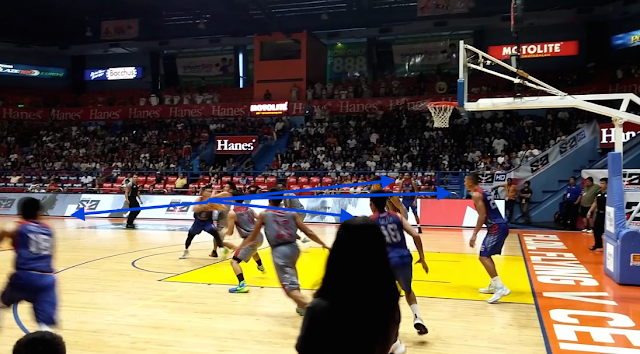 None of the LPU players commit to really get a hand in Jalalon's face so instead of passing he opts to take the high percentage shot. BUCKET. 76-71, Arellano. MY TAKE AND I COULD BE WRONG AND TOPEX ROBINSON IS A MUCH SMARTER BASKETBALL MIND THAN I AM, why not force Jalalon to give up the ball more so since he burned you in four previous possessions. Let Holts get the ball since he was 0-4 at that point. I thought that at this point, maybe they would have needed Joseph Gabayni in so Bulawan can cover more ground defensively.